Do you park in Pike/Pine? 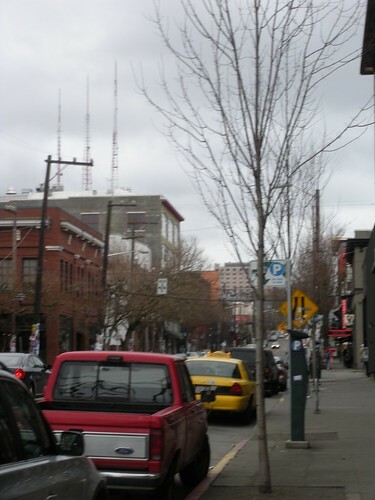 For the past year, the City has been working with Pike/Pine community groups, residents, and businesses to figure out a better way to manage parking in this dense, high demand area. Unfortunately, we didn’t get a lot of feedback. Now that we are developing a final plan (to be released this spring and implemented over the summer), we’d really like to hear from you. SDOT would like to incorporate motorcycle/scooter and on-street bike parking in the plan. So if you get around on 2-wheels, let us know where you’d like to see those types of parking spaces. Visit the project website or our new Facebook page to leave a comment. You can also email me at PikePineParking@seattle.gov. This entry was posted in Uncategorized by aschwartz. Bookmark the permalink. No more of those stupid, wasteful, inefficient, irritating and–this is the most important one–unused on-street bike parking. Some scooter/motorcycle parking would be great on the 12th-15th area, and maybe down towards Broadway as well. But every time I walk or drive past those on-street bike parks (especially that godlessly tacky one outside of Stumptown), there are somewhere between 3 and 0 bikes in them, which I think would make replacing them with sidewalk racks feasible. Let’s get rid of parking for cars. So is there a decent place to possibly put an underground (or an *attractive* above ground) parking garage in or around Capitol Hill? Perhaps its because I’m a southern california native, but I like the idea of clearing out street parking on tiny streets and redirecting it to a garage. Also, I know encouraging a car-culture isn’t so very green, but since Cap Hill still somewhat serves as a destination for Puget Sound gay people, they’ll be much more apt to coming up on the weekends for entertainment (and bolstering our economy) if they had a place to stick their car. Yes, let’s make it impossible to park cars on the hill. You have wonderful ideas and I would like to subscribe to your newsletter. I think we should get through the summer and then judge the popularity of the on-street bike parking. The racks went up a few months ago and it’s been pretty darn cold this winter. My guess is that they’ll be used much more once it warms up. I used to enjoy a beer at the Elysian after work once in a while. For the past 6 months whenever I’ve gone up there I’ve not been able to park – so I go somewhere else. I don’t even try to go shopping on Broadway anymore – I know there is nowhere to park unless I want to get ripped off in the garage under the QFC or behind the BofA. Go to U.Village and it’s free – not a difficult choice. Capitol Hill businesses will have to rely on local residents willing to walk to their shops. Hope that works out for them. The city needs to take action to *provide* parking if it wants to attract people into the neighborhood to spend money – not by restricting it. And at the same time, the folks at Neumos get away with blocking about 10 parking spaces all day, pretty much every day just so that their bands can park at night. Despite what the pundits say, Capitol Hill and Broadway used to be perfectly sustainable without all the new ‘density’. It went downhill due to the business landlords getting greedy. It won’t be sustainable if the only new businesses coming in are frozen yogurt shops and high end restaurants. Following up on “Love” I agree that the price difference between lots and street parking is a problem. It encourages drivers’ circling which wastes gas and creates chaos for pedestrians and cyclists. Some city owned off street parking might be a good idea. Street parking should be more expensive and, more importantly, enforced during nights and weekends. As for the on street bike parking, I think it will fill up rapidly once the sun comes out. I was just thinking the other day how everytime I’ve passed the bike rack on 12th (in front of stumptown) how it was always in use. I think I passed it once, on some dark, dreary, cold morning, where there was only one bike. I pass it at least two times a day. Not sure what time you go by it Brant, 4 am? Not stopping: since you’ve stopped shopping and coming to Cap to the Hill in your car, hundreds moving in at distances easily walkable have replaced you. Year after year, I see more people walking around patronizing restaurants, bars, and shops. Clearly your business was not needed. See ya, don’t let the door hit you in the tail pipe on your way up Madison, down Denny, or down 10th. Have fun sitting in traffic going to U. Village. Agreed! Not Stopping: If The Gap and Coach do it for you, that just means all the more space for us at Atlas and No Parking! Geez. They were just installed. Give folks a chance to create some new habits. That’s six, and more showed up after I took the photo . . .
And can I just say that that for my money a “godlessly tacky” bike rack beats a car any day. Yes Brant P, I would love for you to like my ideas. That would make my life complete. You assessment “stupid, wasteful, inefficient, irritating” is equally insightful. Just wanted to add that The Broadway bike parking was completely filled yesterday afternnon. If we allow huge concrete oceans for the occasional use of stadium events, I think a few parking spaces for bikes should be ok. Restrictions in parking need to be countered with increases in affordable and convenient transportation options so that Pike/Pine doesn’t lose its competitive edge vs. other neighborhoods that offer a mix of shopping/nightlife/culture. I’d prefer that any restrictions on parking in pike/pine get mirrored in Ballard, Fremont, Udistrict, etc. Now, all that said, here’s my opinion on cars and Seattle in general. This city needs to grow up and move away from the unsustainable car-centric development that has dominated the region for the last several generations. Even though 2016 (the opening of CapHill light rail) seems to be getting closer and closer, the East Link is still a distant hope. That’s sad.